For other uses, see Insight (disambiguation). A robotic spacecraft is an uncrewed spacecraft, usually under telerobotic control. A robotic spacecraft designed to make scientific research measurements is often called a space probe. Many space missions are more suited to telerobotic rather than crewed operation, due to lower cost and lower risk factors. In addition, some planetary destinations such as Venus or the vicinity of Jupiter are too hostile for human survival, given current technology. Outer planets such as Saturn, Uranus, and Neptune are too distant to reach with current crewed spacecraft technology, so telerobotic probes are the only way to explore them. InSight's objectives are to place a seismometer, called SEIS, on the surface of Mars to measure seismic activity and provide accurate 3D models of the planet's interior; and measure internal heat flow using a heat probe called HP3 to study Mars' early geological evolution. This could bring a new understanding of how the Solar System's terrestrial planets – Mercury, Venus, Earth, Mars – and Earth's Moon form and evolve. A seismometer is an instrument that responds to ground motions, such as caused by earthquakes, volcanic eruptions, and explosions. Seismometers are usually combined with a timing device and a recording device to form a seismograph. The output of such a device — formerly recorded on paper or film, now recorded and processed digitally — is a seismogram. Such data is used to locate and characterize earthquakes, and to study the earth's internal structure. The Seismic Experiment for Interior Structure (SEIS) is a seismometer and the primary scientific instrument on board the InSight Mars lander launched on 5 May 2018 for a landing on 26 November 2018; the instrument was deployed to the surface of Mars on 19 December. SEIS is expected to provide seismic measurements of Mars, enabling researchers to develop 3D structure maps of the deep interior. Better understanding the Martian interior will lead to better understanding of the Earth, Moon, and rocky planetary bodies in general. Heat transfer is a discipline of thermal engineering that concerns the generation, use, conversion, and exchange of thermal energy (heat) between physical systems. Heat transfer is classified into various mechanisms, such as thermal conduction, thermal convection, thermal radiation, and transfer of energy by phase changes. Engineers also consider the transfer of mass of differing chemical species, either cold or hot, to achieve heat transfer. While these mechanisms have distinct characteristics, they often occur simultaneously in the same system. Phoenix was a robotic spacecraft on a space exploration mission on Mars under the Mars Scout Program. The Phoenix lander landed on Mars on May 25, 2008. Mission scientists used instruments aboard the lander to assess the local habitability and to research the history of water there. The total mission cost was about US $386 million, which includes cost of the launch. InSight comes together with the backshell and surface lander being joined, 2015. The Jet Propulsion Laboratory (JPL) is a federally funded research and development center and NASA field center in La Cañada Flintridge, California, United States, though it is often referred to as residing in Pasadena, California, because it has a Pasadena ZIP Code. The National Centre for Space Studies (CNES) is the French government space agency. Its headquarters are located in central Paris and it is under the supervision of the French Ministries of Defence and Research. Atlas V is an expendable launch system in the Atlas rocket family. It was formerly operated by Lockheed Martin and is now operated by United Launch Alliance (ULA), a joint venture with Boeing. Each Atlas V rocket uses a Russian-built RD-180 engine burning kerosene and liquid oxygen to power its first stage and an American-built RL10 engine burning liquid hydrogen and liquid oxygen to power its Centaur upper stage. The RD-180 engines are provided by RD Amross, while Aerojet Rocketdyne provides both the RL10 engines and the strap-on boosters used in some configurations. The standard payload fairing sizes are 4 or 5 meters in diameter and of various lengths. Fairings sizes as large as 7.2 m in diameter and up to 32.3 m in length have been considered. The rocket is assembled in Decatur, Alabama and Harlingen, Texas. WorldView-4, previously known as GeoEye-2, is a third generation commercial Earth observation satellite launched on 11 November 2016. The spacecraft is operated by DigitalGlobe. With a maximum resolution of 31 cm (12 in), WorldView-4 provides similar imagery as WorldView-3, the highest resolution commercially available at the time of its launch. Seismometers on both Viking spacecraft were mounted on the lander, and picked up vibrations from various operations of the lander and from the wind. However, the Viking 1 lander's seismometer did not deploy properly in 1976 after it landed; the seismometer remained locked and did not unlock. The Viking 2 seismometer did unlock, and was able to vibrate and return data to Earth. One problem was accounting for other data, as this was the issue with an event detected on Sol 80 by the Viking 2 seismometer. When this event was recorded, no wind data were recorded at the same time, so it was not possible to determine if the data indicated a seismic event or wind gust. However, for the Sol 80 event the main problem was not wind noise per se, but rather a lack of other data to rule out other sources of vibrations. Two other problems were the location of the lander and that a certain level of wind on Mars caused a loss of sensitivity for the Viking 2 seismometer. InSight has many other sensors, is placed directly on the surface, and also has a wind shield. Well, seismic investigation is really the heart of this mission. Seismology is the method that we've used to gain almost everything we know, all the basic information about the interior of the Earth, and we also used it back during the Apollo era to understand and to measure sort of the properties of the inside of the moon. 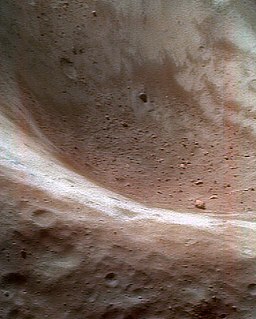 And so, we want to apply the same techniques but use the waves that are generated by Mars quakes, by meteorite impacts to probe deep into the interior of Mars all the way down to its core. The mission will determine if there is any seismic activity, measure the rate of heat flow from the interior, estimate the size of Mars' core and whether the core is liquid or solid. This data would be the first of its kind for Mars. It is also expected that frequent meteor airbursts (10–200 detectable events per year for InSight) will provide additional seismo-acoustic signals to probe the interior of Mars. The mission's secondary objective is to conduct an in-depth study of geophysics, tectonic activity and the effect of meteorite impacts on Mars, which could provide knowledge about such processes on Earth. Measurements of crust thickness, mantle viscosity, core radius and density, and seismic activity should result in a three- to tenfold increase in accuracy compared to current data. This is the first time a robotic lander dug this deep into the martian crust. Instrument Deployment Arm (IDA) is a 2.4 m robotic arm that will be used to deploy the SEIS and HP3 instruments to Mars' surface. It also features the IDC camera. HP3 on the lander deck on Sol 10. On 28 February 2018, InSight was shipped via C-17 cargo aircraft from the Lockheed Martin Space Systems building in Denver to the Vandenberg Air Force Base in California in order to be integrated to the launch vehicle. The lander was launched on 5 May 2018 and arrived on Mars at approximately 19:54 UTC on 26 November 2018. Launch of the Atlas V rocket carrying InSight and MarCO from Vandenberg Space Launch Complex 3-E. The launch was managed by NASA's Launch Services Program. InSight was originally scheduled for launch on 4 March 2016 on an Atlas V 401 (4 meter fairing/zero (0) solid rocket boosters/single (1) engine Centaur) from Vandenberg Air Force Base in California, U.S.,  but was called off in December 2015 due to a vacuum leak on the SEIS instrument. The rescheduled launch window ran from 5 May to 8 June 2018. Several minutes later aeroshell containing lander makes contact with upper Martian atmosphere at 12,300 mph (5.5 kilometers per second). Aeroshell is heated to 2,700 degrees Fahrenheit (1,500 degrees Celsius) during descent, Martian atmosphere is used to slow down. A simulated view of NASA's InSight lander about to land on the surface of Mars. As InSight's science goals are not related to any particular surface feature of Mars, potential landing sites were chosen on the basis of practicality. Candidate sites needed to be near the equator of Mars to provide sufficient sunlight for the solar panels year round, have a low elevation to allow for sufficient atmospheric braking during EDL, flat, relatively rock-free to reduce the probability of complications during landing, and soft enough terrain to allow the heat flow probe to penetrate well into the ground. Artist's concept depicts NASA's InSight lander after it has deployed its instruments on the Martian surface. NASA’s InSight spacecraft unlatched its robotic arm on Nov. 27, 2018, the day after it landed on Mars. On 28 February 2019, the Heat and Physical Properties Package probe (HP³) started its drilling into the surface of Mars. The probe and its digging mole were intended to reach a maximum depth of 5 m (16 ft) about two months after. On 7 March 2019, the HP³ instrument’s mole paused its digging. The mole had made it about 30 cm (12 in) or three quarters of the way out of its housing structure and into the ground. Engineers think the mole hit a rock which caused it to make little progress since 2 March 2019. Both NASA and JPL continue to look into the cause of the under-performing tool and for potential solutions. Scientifically useful measurements are possible at a depth of 3 m (9.8 ft). The second name chip, inscribed with 1.6 million names, is placed on InSight in January 2018. Interactive imagemap of the global topography of Mars, overlain with locations of Mars landers and rovers. Hover your mouse to see the names of over 25 prominent geographic features, and click to link to them. Coloring of the base map indicates relative elevations, based on data from the Mars Orbiter Laser Altimeter on NASA's Mars Global Surveyor . Whites and browns indicate the highest elevations (7004120000000000000♠+12 to +8 km); followed by reds and pinks (7003300000000000000♠+3 to +8 km); yellow is 5000000000000000000♠0 km; greens and blues are lower elevation (down to 2996200000000000000♠−8 km). Axes are latitude and longitude; Poles are not shown. Mariner 3 was one of two identical deep-space probes designed and built by the Jet Propulsion Laboratory (JPL) for NASA's Mariner-Mars 1964 project that were intended to conduct close-up (flyby) scientific observations of the planet Mars and transmit information on interplanetary space and the space surrounding Mars, televised images of the Martian surface and radio occultation data of spacecraft signals as affected by the Martian atmosphere back to Earth. It was the third of ten spacecraft within the Mariner program. Mars Express is a space exploration mission being conducted by the European Space Agency (ESA). The Mars Express mission is exploring the planet Mars, and is the first planetary mission attempted by the agency. "Express" originally referred to the speed and efficiency with which the spacecraft was designed and built. However "Express" also describes the spacecraft's relatively short interplanetary voyage, a result of being launched when the orbits of Earth and Mars brought them closer than they had been in about 60,000 years. 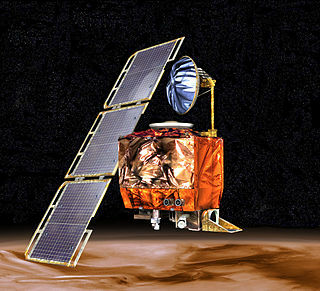 The Mars Climate Orbiter was a 338-kilogram (745 lb) robotic space probe launched by NASA on December 11, 1998 to study the Martian climate, Martian atmosphere, and surface changes and to act as the communications relay in the Mars Surveyor '98 program for Mars Polar Lander. However, on September 23, 1999, communication with the spacecraft was lost as the spacecraft went into orbital insertion, due to ground-based computer software which produced output in non-SI units of pound-force seconds (lbf·s) instead of the SI units of newton-seconds (N·s) specified in the contract between NASA and Lockheed. The spacecraft encountered Mars on a trajectory that brought it too close to the planet, and it was either destroyed in the atmosphere or re-entered heliocentric space after leaving Mars' atmosphere. The Mars Polar Lander, also known as the Mars Surveyor '98 Lander, was a 290-kilogram robotic spacecraft lander launched by NASA on January 3, 1999 to study the soil and climate of Planum Australe, a region near the south pole on Mars. It formed part of the Mars Surveyor '98 mission. On December 3, 1999, however, after the descent phase was expected to be complete, the lander failed to reestablish communication with Earth. A post-mortem analysis determined the most likely cause of the mishap was premature termination of the engine firing prior to the lander touching the surface, causing it to strike the planet at a high velocity. 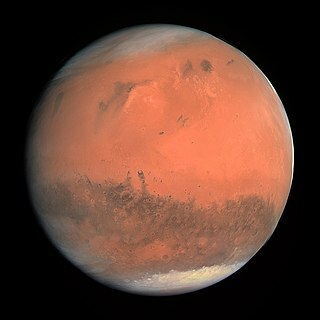 The planet Mars has been explored remotely by spacecraft. Probes sent from Earth, beginning in the late 20th century, have yielded a large increase in knowledge about the Martian system, focused primarily on understanding its geology and habitability potential. Engineering interplanetary journeys is complicated and the exploration of Mars has experienced a high failure rate, especially the early attempts. Roughly sixty percent of all spacecraft destined for Mars failed before completing their missions and some failed before their observations could begin. Some missions have met with unexpected success, such as the twin Mars Exploration Rovers, which operated for years beyond their specification. Mars Science Laboratory (MSL) is a robotic space probe mission to Mars launched by NASA on November 26, 2011, which successfully landed Curiosity, a Mars rover, in Gale Crater on August 6, 2012. The overall objectives include investigating Mars' habitability, studying its climate and geology, and collecting data for a manned mission to Mars. The rover carries a variety of scientific instruments designed by an international team. Timeline for the Mars Reconnaissance Orbiter (MRO) lists the significant events of the launch, aerobraking, and transition phases as well as subsequent significant operational mission events; by date and brief description. A marsquake is a theoretical quake which, much like an earthquake, would be a shaking of the surface or interior of the planet Mars as a result of the sudden release of energy in the planet's interior, such as the result of plate tectonics, which most quakes on Earth originate from, or possibly from hotspots such as Olympus Mons or the Tharsis Montes. The detection and analysis of marsquakes could be informative to probing the interior structure of Mars, as well as identifying whether any of Mars's many volcanoes continue to be volcanically active or not. A Mars landing is a landing of a spacecraft on the surface of Mars. Of multiple attempted Mars landings by robotic, unmanned spacecraft, eight have been successful. There have also been studies for a possible human mission to Mars, including a landing, but none have been attempted. The most recent landing took place on November 26, 2018 by the NASA probe InSight. Europa Clipper is an interplanetary mission in development by NASA comprising an orbiter. Set for a launch in June 2023, the spacecraft is being developed to study the Galilean moon Europa through a series of flybys while in orbit around Jupiter. Mars Cube One was a Mars flyby mission launched on 5 May 2018 alongside NASA's InSight Mars lander mission. It consisted of two nanospacecraft, MarCO-A and MarCO-B, that provided a real-time communications link to Earth for InSight during its entry, descent, and landing (EDL) on 26 November 2018 - when InSight was out of line of sight from the Earth. Both spacecraft were 6U CubeSats, and the mission was a test of new miniaturized communications and navigation technologies. These were the first CubeSats to operate beyond Earth orbit, and aside from telecommunications they also tested CubeSats' endurance in deep space. On 5 February 2019, NASA reported that the CubeSats went silent, and are unlikely to be heard from again. The Heat Flow and Physical Properties Package (HP3) is a science instrument onboard the InSight lander that features a self-penetrating probe to determine how heat flows inside Mars. InSight landed on Mars on 26 November, 2018. In March 2019, it successfully burrowed a short distance into Mars subsurface, but encountered resistance. Farah Alibay is a Canadian Systems Engineer at the NASA Jet Propulsion Laboratory on the Mars InSight mission. Temperature and Winds for InSight (TWINS) is a meteorological suite of instruments on board the InSight lander that landed on Mars on 26 November 2018. TWINS will provide continuous wind and air temperature measurements to help understand the seismic data from the SEIS instrument. The instruments were developed by the Spanish Astrobiology Center at Madrid, Spain. 1 2 3 4 5 6 "InSight Mission Overview". NASA. 2012. Retrieved 26 November 2018. 1 2 3 "Key Facts About NASA's InSight". NASA. 2012. Retrieved 26 November 2018. 1 2 3 4 5 6 7 8 9 10 11 12 13 14 15 16 "Mars InSight Launch Press Kit" (PDF). NASA/JPL. May 2018. Retrieved 12 December 2018. ↑ "InSight Lithograph" (PDF). NASA. July 2015. LG-2015-07-072-HQ. 1 2 3 4 5 6 7 Chang, Kenneth (5 May 2018). "NASA's InSight Launches for Six-Month Journey to Mars". The New York Times . Retrieved 5 May 2018. 1 2 3 4 Clark, Stephen (9 March 2016). "InSight Mars lander escapes cancellation, aims for 2018 launch". Spaceflight Now. Retrieved 9 March 2016. 1 2 Clark, Stephen (19 December 2013). "Mars lander to launch from California on Atlas 5 in 2016". Spaceflight Now. Retrieved 20 December 2013. 1 2 3 "NASA Evaluates Four Candidate Sites for 2016 Mars Mission". NASA. 4 September 2013. Retrieved 4 September 2013. ↑ "Single Site on Mars Advanced for 2016 NASA Lander". NASA. 4 March 2015. Retrieved 16 December 2015. ↑ MarCO: Planetary CubeSats Become Real. Van Kane, The Planetary Society. 8 July 2015. ↑ Chang, Kenneth (30 April 2018). "Mars InSight: NASA's Journey Into the Red Planet's Deepest Mysteries". The New York Times . Retrieved 30 April 2018. 1 2 3 Vastag, Brian (20 August 2012). "NASA will send robot drill to Mars in 2016". The Washington Post . 1 2 3 4 5 The Editorial Board (27 November 2018). "Mars Beckons - Scientists hope to uncover some of the secrets of that distant world — and maybe some of our own". The New York Times . Retrieved 28 November 2018. 1 2 Chang, Kenneth (26 November 2018). "NASA's Mars InSight Landing: Back to the Red Planet Once Again – The NASA spacecraft will arrive at the red planet today and attempt to reach its surface in one piece". The New York Times . Retrieved 26 November 2018. ↑ Gabbatt, Adam (2018-11-26). "InSight lander: Nasa probe approaches Mars – live updates". The Guardian. Retrieved 26 Nov 2018. 1 2 3 4 "About InSight's Launch". NASA. Retrieved 8 February 2018. ↑ Agle, D.C.; Good, Andrew; Brown, Dwayne; Wendel, JoAnna (5 May 2018). "NASA, ULA Launch Mission to Study How Mars Was Made" . Retrieved 5 May 2018. ↑ "What are InSight's Science Tools?". NASA. Retrieved 8 February 2018. ↑ David, Leonard (14 November 2017). "NASA's Next Mars Lander Zooms toward Launch". Scientific American. Archived from the original on 14 November 2017. Webster, Guy; Brown, Dwayne; Cantillo, Laurie (2 September 2016). "NASA Approves 2018 Launch of Mars InSight Mission". NASA. Retrieved 8 January 2018. ↑ Cavendish, Lee (25 November 2018). "Journey to the Center of the Red Planet: NASA's InSight Lander to Reveal the Secrets Inside Mars". Space.com. Retrieved 28 November 2018. ↑ Wells, Jason (28 February 2012). "JPL changes name of Mars mission proposal". Times Community News via Los Angeles Times. Retrieved 25 September 2016. ↑ "New NASA Mission To take First Look Deep Inside Mars". NASA. 20 August 2012. ↑ "NASA Selects Investigations For Future Key Planetary Mission". NASA. 5 May 2011. Retrieved 6 May 2011. ↑ Taylor, Kate (9 May 2011). "NASA picks project shortlist for next Discovery mission". TG Daily. Retrieved 20 May 2011. ↑ Webster, Guy; Brown, Dwayne; Napier, Gary (19 May 2014). "Construction to Begin on 2016 NASA Mars Lander". NASA. Retrieved 20 May 2014. ↑ Webster, Guy; Brown, Dwayne (27 May 2015). "NASA Begins Testing Mars Lander for Next Mission to Red Planet". NASA. Retrieved 28 May 2015. ↑ Clark, Stephen (5 March 2016). "Fate of NASA's InSight Mars mission to be decided soon". Spaceflight Now. Retrieved 9 March 2016. 1 2 Chang, Kenneth (9 March 2016). "NASA Reschedules Mars InSight Mission for May 2018". The New York Times . Retrieved 9 March 2016. 1 2 Foust, Jeff (28 March 2016). "InSight's second chance". The Space Review. Retrieved 5 April 2016. ↑ "NASA Targets May 2018 Launch of Mars InSight Mission". NASA. 9 March 2016. Retrieved 9 March 2016. ↑ Bergin, Chris (22 November 2017). "Mars InSight mission passes TVAC testing ahead of 2018 launch". NASASpaceFlight.com . Retrieved 6 January 2018. ↑ Good, Andrew (23 January 2018). "NASA's Next Mars Lander Spreads its Solar Wings". NASA. ↑ Anderson, Don L.; et al. (September 1977). "Signatures of Internally Generated Lander Vibrations" (PDF). Journal of Geophysical Research. 82 (28): 4524–4546, A–2. Bibcode:1977JGR....82.4524A. doi:10.1029/JS082i028p04524. ↑ "Happy Anniversary, Viking Lander". Science@NASA. NASA. 20 July 2001. 1 2 Howell, Elizabeth (6 December 2012). "Viking 2: Second Landing on Mars". Space.com. Retrieved 15 November 2017. ↑ Nakamura, Y.; Anderson, D. L. (June 1979). "Martian wind activity detected by a seismometer at Viking lander 2 site" (PDF). Geophysical Research Letters. 6 (6): 499–502. Bibcode:1979GeoRL...6..499N. doi:10.1029/GL006i006p00499. ↑ Lorenz, Ralph D.; Nakamura, Yosio; Murphy, James R. (November 2017). "Viking-2 Seismometer Measurements on Mars: PDS Data Archive and Meteorological Applications". Earth and Space Science. 4 (11): 681–688. Bibcode:2017E&SS....4..681L. doi:10.1002/2017EA000306. ↑ Goins, N.R. ; et al. (June 1981). "Lunar seismology – The internal structure of the moon". Journal of Geophysical Research. 86: 5061–5074. Bibcode:1981JGR....86.5061G. doi:10.1029/JB086iB06p05061. hdl:1721.1/52843. ↑ Redd, Nola Taylor; January 6, Space com Contributor |; ET, 2011 05:39pm. "Details of the Moon's Core Revealed by 30-year-old Data". Space.com. Retrieved 2018-12-22. ↑ Bell, Trudy E. (15 March 2006). "Moonquakes". Science@NASA. NASA Science Mission Directorate. Retrieved 31 January 2018. ↑ "Gravity Assist: Mars and InSight with Bruce Banerdt". Solar System Exploration: NASA Science. Retrieved 2018-12-22. 1 2 3 Banerdt, W. Bruce (7 March 2013). InSight: A Geophysical Mission to a Terrestrial Planet Interior (PDF). Committee on Astrobiology and Planetary Science. 6–8 March 2013. Washington, D.C.
1 2 3 4 Banerdt, W. Bruce (2013). InSight Project Status (PDF). 28th Mars Exploration Program Analysis Group Meeting. 23 July 2013. Virtual meeting. Archived from the original (PDF) on 2016-12-22. Retrieved 2016-09-25. 1 2 3 "InSight: Mission". NASA/Jet Propulsion Laboratory . Retrieved 2 December 2011. ↑ Panning, Mark; Lognonne, Philippe; Banerdt, Bruce; et al. (October 2017). "Planned Products of the Mars Structure Service for the InSight Mission to Mars". Space Science Reviews. 211 (1–4): 611–650. doi:10.1007/s11214-016-0317-5. hdl:10044/1/48928. 1 2 "InSight: Science". NASA/Jet Propulsion Laboratory. Retrieved 2 December 2011. ↑ Kremer, Ken (2 March 2012). "NASAs Proposed 'InSight' Lander would Peer to the Center of Mars in 2016". Universe Today. Retrieved 27 March 2012. ↑ Stevanović, J.; et al. (October 2017). "Bolide Airbursts as a Seismic Source for the 2018 Mars InSight Mission". Space Science Reviews. 211 (1–4): 525–545. Bibcode:2017SSRv..211..525S. doi:10.1007/s11214-016-0327-3. 1 2 3 Agle, D. C. (20 August 2012). "New Insight on Mars Expected From new NASA Mission". NASA. 1 2 3 "Mars Cube One (MarCO)". NASA. Retrieved 8 February 2018. ↑ mars.nasa.gov. "Getting to Mars | Spacecraft". NASA's InSight Mars Lander. Retrieved 2018-12-24. ↑ "NASA's Martian quake sensor InSight lands at slight angle". France 24. 2018-12-01. Retrieved 2018-12-09. "SolAero Awarded Solar Panel Manufacturing Contract by ATK for NASA's InSight Mars Lander Mission" (Press release). SolAero. 26 February 2014. Retrieved 13 June 2015. "UltraFlex Solar Array Systems" (PDF). Orbital ATK. Retrieved 13 June 2015. 1 2 Lewin, Sarah; December 2, Space com Associate Editor |; ET, 2018 02:00pm. "NASA's InSight Lander on Mars Just Set a Solar Power Record!". Space.com. Retrieved 2018-12-09. ↑ Dvorsky, George (20 February 2019). "You Can Now Check the Weather on Mars Every Day". Gizmodo . Retrieved 20 February 2019. ↑ Berger, Eric (20 February 2019). "With the best air pressure sensor ever on Mars, scientists find a mystery". Ars Technica . Retrieved 20 February 2019. ↑ Monday, Erica Naone | Published:; April 30; 2018. "InSight spacecraft will soon peer deep into the interior of Mars". Astronomy.com. Retrieved 2018-12-10. "NASA and French Space Agency Sign Agreement for Mars Mission" (Press release). NASA. 10 February 2014. Retrieved 11 February 2014. Boyle, Rebecca (4 June 2015). "Listening to meteorites hitting Mars will tell us what's inside". New Scientist. Retrieved 5 June 2015. Kumar, Sunil (1 September 2006). Design and development of a silicon micro-seismometer (PDF) (Ph.D.). Imperial College London. Retrieved 15 July 2015. Francis, Matthew (21 August 2012). "New probe to provide InSight into Mars' interior". Ars Technica . Retrieved 21 August 2012. Lognonné, P.; Banerdt, W. B.; Giardini, D.; Christensen, U.; Pike, T.; et al. (October 2011). The GEMS (GEophysical Monitoring Station) SEISmometer (PDF). EPSC-DPS Joint Meeting 2011. 2–7 October 2011. Nantes, France. Bibcode:2011epsc.conf.1507L. EPSC-DPS2011-1507-1. ↑ Panning, Mark P.; et al. (October 2017). "Planned Products of the Mars Structure Service for the InSight Mission to Mars" (PDF). Space Science Reviews. 211 (1–4): 611–650. Bibcode:2017SSRv..211..611P. doi:10.1007/s11214-016-0317-5. hdl:10044/1/48928. 1 2 3 4 5 6 7 8 Banerdt, W. Bruce (2012). InSight – Geophysical Mission to Mars (PDF). 26th Mars Exploration Program Analysis Group Meeting. 4 October 2012. Monrovia, California. 1 2 David, Leonard (15 August 2014). "NASA's Next Mars Lander Will Peer Deep Into Red Planet's History: Here's How". Space.com. Retrieved 16 August 2014. 1 2 Grott, M.; Spohn, T.; Banerdt, W.B. ; Smrekar, S.; Hudson, T. L.; et al. (October 2011). Measuring Heat Flow on Mars: The Heat Flow and Physical Properties Package on GEMS (PDF). EPSC-DPS Joint Meeting 2011. 2–7 October 2011. Nantes, France. Bibcode:2011epsc.conf..379G. EPSC-DPS2011-379-1. 1 2 Kelly, Tiffany (22 May 2013). "JPL begins work on two new missions to Mars". Glendale News-Press. Retrieved 24 August 2015. ↑ "HP3 (Heat Flow and Physical Properties Probe)". NASA. Retrieved 24 August 2015. ↑ "Polish Kret will fly to Mars". Science in Poland. Retrieved 2018-05-05. ↑ Dehant, V.; Folkner, W.; Le Maistre, S.; Rosenblatt, P.; Yseboodt, M.; et al. (October 2011). Geodesy on GEMS (GEophysical Monitoring Station) (PDF). EPSC-DPS Joint Meeting 2011. 2–7 October 2011. Nantes, France. Bibcode:2011epsc.conf.1551D. EPSC-DPS2011-1551. ↑ Dell'Agnello, S.; et al. (October 2017). Lunar, Cislunar, Near/Farside Laser Retroreflectors for the Accurate: Positioning of Landers/Rovers/Hoppers/Orbiters, Commercial Georeferencing, Test of Relativistic Gravity, and Metrics of the Lunar Interior (PDF). 2017 Annual Meeting of the Lunar Exploration Analysis Group. 10–12 October 2017. Columbia, Maryland. Bibcode:2017LPICo2041.5070D. Contribution NO. 2041. 1 2 Banerdt, W. Bruce (6 October 2016). InSight Status Report (PDF). 32nd Mars Exploration Program Analysis Group Meeting. 6 October 2016. Virtual. 1 2 "Schiaparelli science package and science investigations". European Space Agency. 19 October 2016. ↑ Dell'Agnello, S. (2016). MoonLIGHT and INRRI: Status and Prospects. CSN2 Space Meeting. 20 July 2016. INFN-LNGS, Italy. Istituto Nazionale di Fisica Nucleare. 1 2 "Cameras". InSight. NASA. Retrieved 8 February 2018. ↑ Golombek, Matt; Banerdt, W. Bruce (2014). InSight Project Status and Landing Site Selection (PDF). 29th Mars Exploration Program Analysis Group Meeting. 13–14 May 2014. Crystal City, Virginia. ↑ "MarCO Separates from the Centaur Upper Stage – Mars InSight". blogs.nasa.gov. Retrieved 2018-12-10. ↑ "NASA InSight Mission to Mars Arrives at Launch Site". NASA. 28 February 2018. Retrieved 5 March 2018. 1 2 "NASA Awards Launch Services Contract for InSight Mission". NASA. 19 December 2013. Retrieved 11 January 2014. ↑ "NASA calls off next Mars mission because of instrument leak". Excite News. Associated Press. 22 December 2015. Retrieved 22 December 2015. ↑ Chang, Kenneth (22 December 2015). "Leaks in Instrument Force NASA to Delay Mars Mission Until 2018". The New York Times . Retrieved 22 December 2015. ↑ Brown, Dwayne; Cantillo, Laurie; Webster, Guy; Watelet, Julien (22 December 2015). "NASA Suspends 2016 Launch of InSight Mission to Mars". NASA. Retrieved 23 December 2015. 1 2 3 4 "Surface Operations". Mars InSight Mission. NASA. Retrieved 27 November 2018. 1 2 3 4 NASA InSight Team on Course for Mars Touchdown. NASA News. 21 November 2018. ↑ mars.nasa.gov. "Cruise | Timeline". NASA's InSight Mars Lander. Retrieved 2018-12-12. ↑ Clark, Stephen. "InSight tweaks trajectory to home in on Mars landing site – Spaceflight Now" . Retrieved 2018-12-12. ↑ mars.nasa.gov. "Entry, Descent, and Landing | Landing". NASA's InSight Mars Lander. Retrieved 2018-12-12. ↑ "InSight Is Catching Rays on Mars – NASA's InSight Mars Lander". NASA. Retrieved 2018-11-27. ↑ Vergano, Dan (4 September 2013). "NASA searches for (literally) boring Mars landing site". USA Today . Retrieved 5 September 2013. ↑ Boyle, Alan (5 March 2015). "NASA Picks Prime Target for 2016 InSight Mars Lander". NBC News. Retrieved 5 March 2015. ↑ Wall, Mike (11 March 2015). "NASA Eyeing Landing Site for 2016 Mars Mission". Space.com. Retrieved 11 March 2015. ↑ Golombek, M.; et al. (2017). Selection of the 2018 Insight Landing Site. 48th Lunar and Planetary Science Conference. 20–24 March 2017. The Woodlands, Texas. Bibcode:2017LPI....48.1515G. LPI Contribution No. 1964, id.1515. ↑ "InSight's Landing Site: Elysium Planitia". NASA. 25 January 2018. Retrieved 1 February 2018. ↑ "Mars InSight Lander Seen in First Images from Space". NASA/JPL. Retrieved 2018-12-15. ↑ mars.nasa.gov. "Surface Operations | Timeline". NASA's InSight Mars Lander. Retrieved 2018-12-09. ↑ "Mars InSight Deploys Its Solar Panels - SpaceRef". spaceref.com. Retrieved 2018-12-09. ↑ Lewin, Sarah; December 2, Space com Associate Editor |; ET, 2018 02:00pm. "NASA's InSight Lander on Mars Just Set a Solar Power Record!". Space.com. Retrieved 2018-12-09. 1 2 Cook, Jia-Rui; Good, Andrew (19 December 2018). "NASA's InSight Places First Instrument on Mars". NASA . Retrieved 20 December 2018. ↑ Brown, Katherine (2018-12-07). "NASA InSight Lander 'Hears' Martian Winds". NASA. Retrieved 2018-12-09. ↑ InSight lander completes seismometer deployment on Mars. Stephen Clark, Space Flight Now. 4 February 2019. ↑ NASA's InSight Prepares to Take Mars' Temperature. Jet Propulsion Laboratory, NASA.13 February 2019. ↑ Taking Mars' Vital Signs with CCD Image Sensors. George Leopold, EET Asia. 31 January 2019. ↑ Wall, Mike (12 May 2015). "NASA Wants New Rocket Rides for Tiny CubeSats". Space.com. Retrieved 13 May 2015. ↑ Dean, James (16 May 2015). "NASA seeks launchers for smallest satellites". Florida Today. Retrieved 16 May 2015. ↑ Schulze-Makuch, Dirk (9 June 2015). "CubeSats to the Rescue?". Smithsonian Air & Space. Retrieved 9 June 2015. ↑ "JPL | Cubesat | MarCO". www.jpl.nasa.gov. Retrieved 2018-12-09. ↑ Messier, Douglas (27 May 2015). "Two Tiny 'CubeSats' Will Watch 2016 Mars Landing". Space.com. Retrieved 27 May 2015. ↑ Asmar, Sami; Matousek, Steve (20 November 2014). Mars Cube One (MarCO) – The First Planetary CubeSat Mission (PDF). NASA/Jet Propulsion Laboratory. Retrieved 27 May 2015. ↑ Good, Andrew; Wendel, JoAnna (5 February 2019). "Beyond Mars, the Mini MarCO Spacecraft Fall Silent". NASA . Retrieved 5 February 2019. ↑ NASA's first image of Mars from a CubeSat. Science Daily. 22 October 2018. ↑ VACCO - CubeSat Propulsion Systems. VACCO. 2017. ↑ MarCO - Mars Cube One. Slide presentation. NASA/JPL. 28 September 2016. 1 2 "InSight: People". NASA/Jet Propulsion Laboratory. Retrieved 2 December 2011. ↑ "JPL Science: People – Bruce Banerdt". NASA/Jet Propulsion Laboratory. Retrieved 2 December 2011. ↑ "JPL Sciences: People – Sue Smrekar". NASA/Jet Propulsion Laboratory. Retrieved 2 December 2011. ↑ Mars InSight Landing Press Kit. (PDF) NASA. Published: November 2018. ↑ Szondy, David (6 November 2017). "NASA probe to carry over 2.4 million names to Mars". New Atlas. Retrieved 8 January 2018. ↑ Santiago, Cassandra; Ahmed, Saeed (1 November 2017). "Today's the last day to get your boarding pass to Mars". CNN. Retrieved 8 January 2018. 1 2 3 "Names Chip Placed on InSight Lander Deck". NASA/Jet Propulsion Laboratory. 17 December 2015. Retrieved 4 March 2018. 1 2 "Second Names Chip is Placed on InSight". NASA/Jet Propulsion Laboratory. 24 January 2018. Retrieved 4 March 2018. Wikimedia Commons has media related to InSight . Launches are separated by dashes ( – ), payloads by dots ( ·), multiple names for the same satellite by slashes ( / ). CubeSats are smaller.